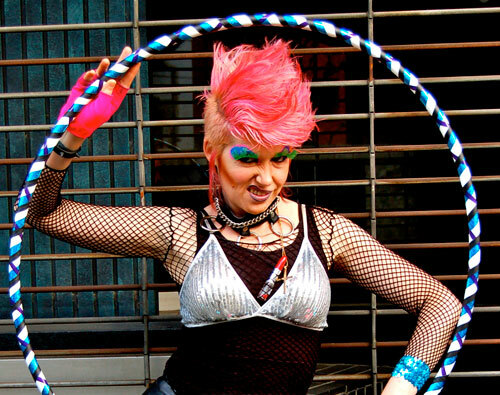 Yesterday was a photoshoot with Deanne for Hooplovers new line of hula hoops. This is my alter ego, Tink, with her namesake hoop. She likes it, really. You will like the new hoops, too, when they go on sale soon. You can see more photos from the shoot on Deanne’s Flickr set. They aren’t quite all so rebellious. Helen and I were inspired by your sneer and practiced ours in the mirror yesterday. We love the photos! love these. i’m very fond of pics page one, row four, third and fourth from left.